This is a delicious spicy snack and main course also. 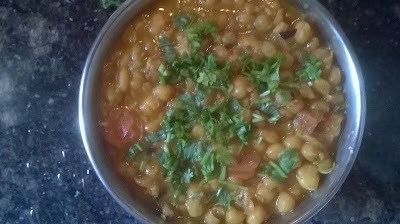 Matar ke chole can be as a snack or as a main dish with kulcha or Nan and rice also. You can make this chole and have it with kulcha. Chole kulcha is one of the most relished street food all over India. You can serve chole with tamarind chutneys and chopped onion, green chili, and sev as an evening snack. 1.Rinse the dried peas with water thoroughly and soak them in water for 8 to 10 hours or overnight. Drain out the excess water and soaked dried peas are ready to use.